I do not wear much jewellery, a wedding ring and maybe some cufflinks. 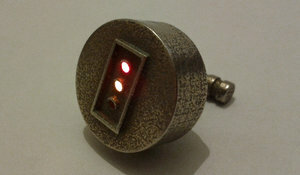 I had a set of Traffic Light shaped cufflinks printed, but someone complained that they do not work as traffic lights. So out came the soldering iron. The coin-sized PCB hiding inside the case plays host to a red, amber, and green surface mount LED. To either side of them you’ll find an ATtiny45 and a RV-8564-C2. The latter is a surface mount RTC with integrated crystal oscillator, perfect for a project where space is very tight. The design uses the case as a touch sensor. Every few seconds the ATtiny wakes up to see if the link is being touched. This ensures that the coin cell isn’t drained by constantly driving the LEDs. The touch-based menu system lets you run the links like a stop light, or display the time, date, or current temperature. See a quick demo clip after the break.